My instances are able to communicate to the network external to openstack. However, I am unable to communicate to my instances via their floating IP. Upon running tcpdump on multiple points in the connection path I see that the ICMP echo request gets through all portions of the connection up until the TAP connected to my instance. Once I run a tcpdump on the TAP interface, I am no longer able to see the traffic. Any ideas what could be preventing traffic from getting from the bridge to the tap interface? What should I be checking? The default firewall rules seem to allow ICMP traffic from any device to any other device. You state that on both ends of veth-pair (qvo-xxxxx,qvb-xxxxxx) tcpdump is OK . Am I correct ? Please, post ovs-vsctl show && ifconfig on Network Node as UPDATE to question. Delete all of the default rules. Add three new rule sets : All ICMP/ALL TCP/ALL UDP. Allow it from 0.0.0.0. Afterwards test again. If you are still running into issues please look into what DBaxps posted. Hey mpetason, why would the default rules now allow this traffic? I see the default is supposed to allow "Any" traffic on IP Protocol using "Any" port for IPv4 and IPv6 ingress and egress. All projects have a "default" security group, which is applied to instances that have no other security group defined. Unless changed, this security group denies all incoming traffic. 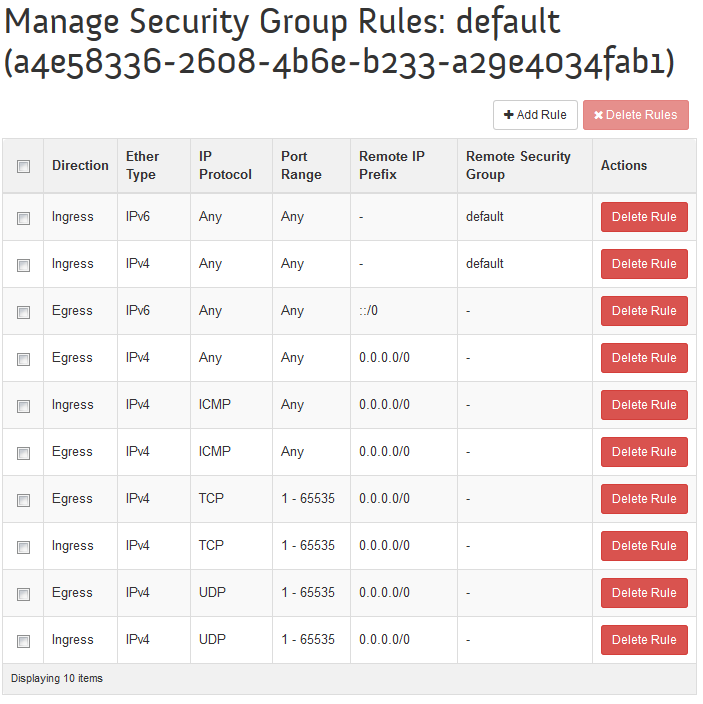 they only allow everything from other VMs (ports to be precise) that are also in security group named "default" - that is what the "Remote Security Group" column means. Yep, it's confusing. Anyway you will need to add a rule to allow icmp from some CIDR. This solution worked. I had to add a bunch of new security rules under my specific project to allow TCP/UDP and ICMP. Here's a screenshot of the result http://i.imgur.com/WM6cFeX.png. Are these essentially just defining NAT rules to pass traffic in from floating to private IP?